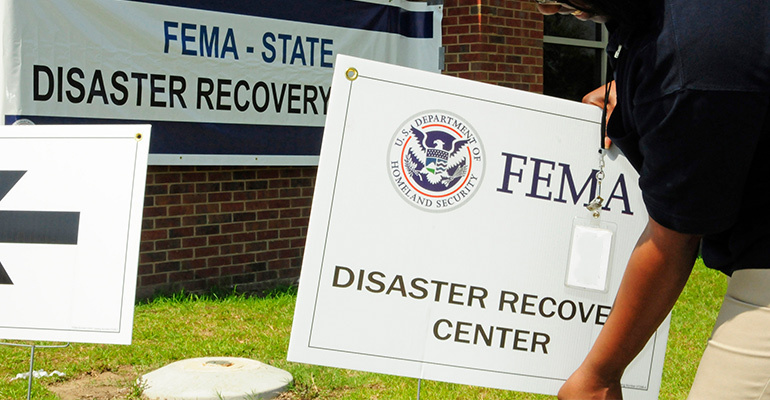 FEMA is supposed to clean up disasters -- not create more. Unfortunately for three Texas churches, the Federal Emergency Management Agency is doing more harm than good. When Hurricane Harvey blew through the state, leaving a trail of wreckage and devastation behind, congregations like Hi-Way Tabernacle's leapt into action -- even though their own buildings had sustained a lot of damage. But despite doing as much (or more) than a lot of the government funded teams on the ground, faith-based groups are getting the short-end of the relief fund stick. When a trio of churches applied for FEMA aid, they were turned down for a single reason: their religion. So, with the help of the Becket Fund, the congregations sued for the same benefits as everyone else. President Trump piled on, tweeting "Churches in Texas should be entitled to reimbursement from FEMA Relief Funds for helping victims of Hurricane Harvey (just like others)." Weeks later, FEMA's policy hasn't caught up with the president's direction. In response, Governor Greg Abbott (R-Texas) and Attorney General Ken Paxton (R-Texas) fired off a letter to the White House hoping to give the administration the push it needs to rewrite its rules. "Churches have opened their doors to feed, shelter, comfort, and rebuild their communities -- even hosting FEMA operations in the process -- but this policy has made those very same churches ineligible for assistance because their primary use is, by nature, religious," they wrote. "The policy of denying relief funds for churches discriminates on the grounds of religion and is nothing more than the relic of an administration that preferred rewriting laws to faithfully executing them." Like Becket attorneys, the Texas leaders point out that the Supreme Court's recent ruling in Trinity Lutheran created a level playing field for churches when it comes to government programs. FEMA is no exception. And while the Trump administration didn't create FEMA's discriminatory policy, it's just another example of the religious hostility that's built up over the last decade. The only way these attacks on faith cease is for those policies to be reversed. Not just stopped, but overturned. President Trump issued his religious liberty Executive Order on May 4 directing the Department of Justice to issue guidance to all federal agencies on "protecting and promoting" religious freedom. FEMA's religious intolerance in Texas underscores the immediate need for the DOJ's guidance.